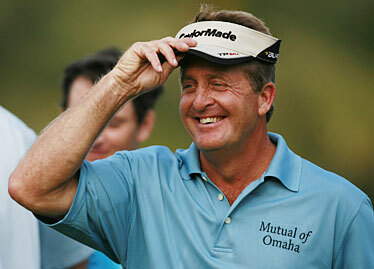 Fred Funk is playing what he calls "the Hawaiian Slam," two PGA Tour events and two on the Champions Tour, including the MasterCard Championship starting tomorrow on the Big Island. The Champions Tour may be younger than Tiger Woods, but the participants in the 50 and older set have more memories and accomplishments than anyone can count. That is quite evident when looking at the field of 42 golfers taking part in tomorrow's silver anniversary edition of the MasterCard Championship at Hualalai. From top to bottom, it's a competitive collection of past champions that includes seven players who are members of the World Golf Hall of Fame. The largest field in the 25-year history of this winners-only tournament has combined for 28 major titles on the PGA Tour and 31 majors on the senior circuit as well. In the field for this weekend's 54-hole event are such past greats as defending MasterCard champion Hale Irwin, former University of Texas teammates Ben Crenshaw and Tom Kite, former European Ryder Cup captain Bernhard Langer, back-to-back U.S. Open champion Curtis Strange, six-time major winner Lee Trevino and Tom Watson, who captured eight major championships himself. You could keep listing all their accomplishments deep into the night, but suffice to say the field is a good one. What makes it even more intriguing is the number of first-time winners making their inaugural trip to the Big Island resort. There will be eight newcomers walking the popular par-72 design by Jack Nicklaus that's guaranteed to produce plenty of birdies in this lava patch. Among the first-timers here are Langer, John Cook, Scott Hoch and Denis Watson, one of six multiple Champions Tour winners. Cook is so serious about playing this tour he skipped the Bob Hope Chrysler Classic on the PGA Tour for the first time in 28 years. "I had played the Bob Hope right from my rookie season as my first tour event when I had gotten my tour card," Cook said in a conference call yesterday. "I was always a great supporter of the Bob Hope and the tournament there. I had actually intended to play again this year. Then something happened to me in San Antonio (he won) that kind of set my schedule in a very, very positive way. That got me in the first event over here, the MasterCard Championship." Cook won his first Champions Tour event in only his second try and said yesterday he might not play at all on the PGA side of the fairway, just concentrate on doing as well as he can out here. Granted, the 1992 United Airlines Hawaiian Open winner remained competitive into his late 40s, but he's worked hard on his game and believes it could pay off out here in 2008. "I've been looking forward to this opportunity for a few years," Cook said. "This kind of revitalized me." It did the same thing for Loren Roberts, Jay Haas and even Fred Funk , who's playing in his third tournament in the island chain after two stops with the big boys at the Mercedes-Benz Championship and the Sony Open in Hawaii. "I'm having a blast," Funk said after finishing in a tie for 25th at the Mercedes and a tie for 10th at the Sony. He's already won $185,571 -- good enough for 19th on the PGA Tour with 746 FedExCup points. Now it's time to collect some Charles Schwab Cup points out here the next two weeks. "I can't wait to play the next two (MasterCard and Turtle Bay, where he is defending champion.) I call it the Hawaiian Slam." Call it whatever you like, but Funk has already played eight rounds of golf at the highest level. He finished first in driving accuracy at the Sony and has to be an early favorite in this tournament as well. And don't forget about Jay Haas. Like Funk, he juggled two tours for a couple of years in his 50s before turning his full attention to the old-boy network in 2006. The results have been good. He is the two-time Player of the Year honoree and would like nothing better than winning that award three consecutive seasons, something no one has done before him. And don't forget about Irwin. He owns the Hawaiian Islands, giving local fans plenty to watch over the next two weeks. "Five of our scoring records were set in 2007," Champions Tour commissioner Rick George said yesterday. "Our average winning score was 66.8 and our scoring average overall of 71.39 is the best in our history. I think that speaks volumes of the kind of quality player that we have on this tour."